This week I know I was supposed to give my how to on these cutesy fridge magnets, but due to some lighting issues it will only be posted tomorrow. BUT I have an even easier option to make your very own fridge magnets for under R35. And it is a very nice activity to do with your kids. Last week I gave you some ideas on what to make for dad, I was inspired by this and decided to make something similar. 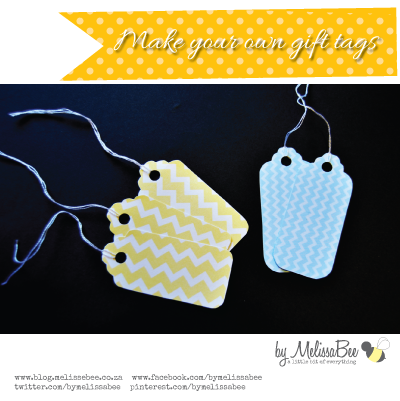 I love this idea because you can use it as an add on for another gift or you can use it on it’s own. Because this month is Father’s Day (for most countries around the world), I am focusing some of my posts on fathers (or men). This week I decided that my ice tongs was a bit too bland and needed some bling. I bought myself a pack of stick on diamantes to embellish my tongs, I’ve seen these on blogs and thought they looked very striking. So exciting! My first video tutorial! Yeah! The reason I made this tutorial was that many people I know don’t have the privilege to own design software and all they have is either MS Word or Publisher. Not ideal as many don’t know you can actually use these programs to make unique designs and you don’t have to be stuck using the standard files or patterns. These are the pretty gift tags I made using Word and making the shapes in Word. The pattern is available in my shop. I used the the Magenta color for this tutorial. If you can’t download, or watch the tutorial I have the PDF available here as well.